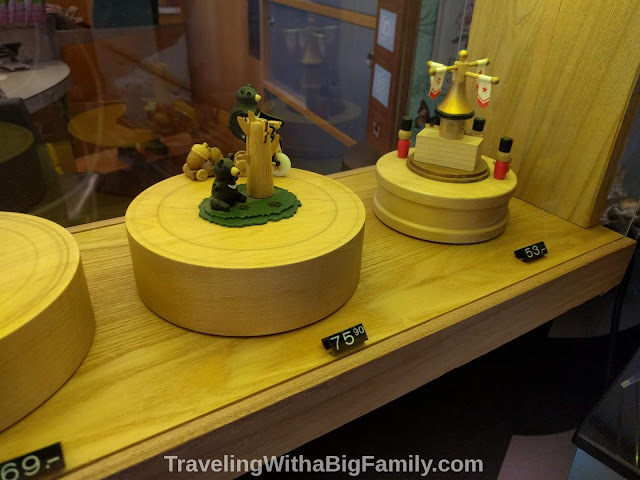 Should You Visit the Toy Museum? We've visited just two toy museums so far - one in Europe, and one in Asia. Both times, the decision to visit was based on...well, not having much else to do that afternoon - and in one case, it was a way to stop being cooped up in the rental house on a rainy day. 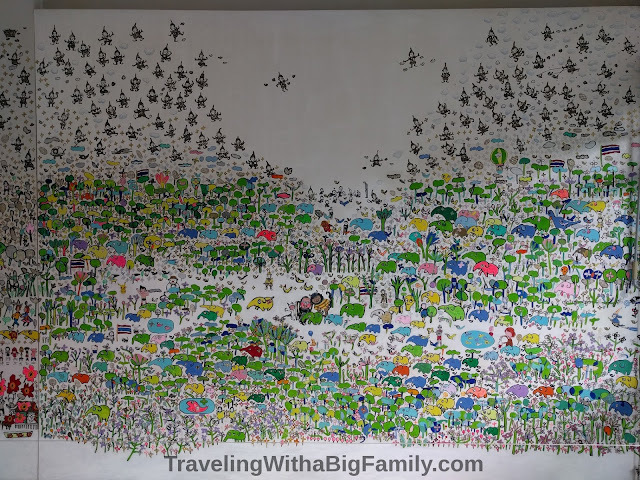 But we enjoyed them both so much that we would definitely recommend them to any family traveling slowly, as an activity that younger children will most likely enjoy. What is a "Toy Museum?" To me, those two words - "toy museum" - don't really seem to go together. How can toys be the basis of a museum? We weren't expecting much from these visits. But we were very pleasantly surprised! What we found in these places was a giant, private collection of toys. Over a lifetime, a private collector may have amassed 30,000 to 100,000+ individual toys. Usually there are some themes represented - the collector may have been fascinated by miniature models of 1800's village life, collecting numerous tiny sets complete with lights, sound, and motion features. Or the collector may have been in love with giant, fighting, hero robots, and acquired over 100 versions of toys all based on that one character, plus loads of other sci-fi and fantasy characters. Once some labels are added (or not), and once the thousands of items are put into glass display cases (or not) in some semblance of a logical order (or not), a massive collection eventually becomes a "toy museum" by virtue of hanging a sign out front and charging a modest admission price at the entrance. What Do They Have in Toy Museums? There's something very eclectic about these collections. It's definitely not all toys, but toys are the main point. The focus of the collection is a bit blurry, and subject to seemingly unplanned drift. You can imagine how, once your friends and family know that you are nutty for Star Wars toys, they will start giving you not only accidental duplicates of Star Wars toys you already have, but also random, seemingly-related-but-actually-unrelated items, like Star Trek figures and model starships from the Alien movie series. Being a collector, these items get kept in pristine condition, rather than given away, donated, or discarded. What once occupied a bedroom shelf grows until it fills a room, and continues expanding until it occupies an entire house or warehouse. I can't walk through a place like this without wondering about the mind of the individual who collected the toys and other items. The collections are fascinating, but...imagine all the things in life this person did not do, or could not afford, because of the need to have a 6th, 7th, and 8th copy of a life-size Ultraman. What drives a person to possess not one or two, or five, but over a dozen of the same exact toy? Because that's one thing that you see a lot of, in these museums: individual collections in which it's pretty obvious that the collector intentionally set out to acquire as many identical copies as possible of one particular Han Solo figure, or one particular Hello Kitty wind-up car. In many cases, an item will be truly unusual, and rare - except for the fact that the collector has four of them. Why? That's a big part of what interests me about these toy museums. It's like walking through the brain of an extremely eccentric person - one who probably thought about toys to the extent that they had to exclude the sorts of things that you or I spend most of our time thinking about. There are numerous toy museums - at least 30 - around the globe. 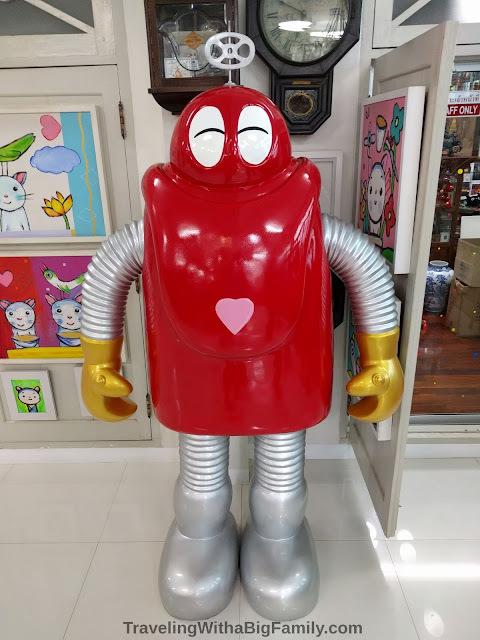 There are toy museums in Scotland, Spain, Germany, Belgium, India, England, Russia, Malaysia, Greece, Hong Kong, Finland, Mexico, the Czech Republic, and numerous states of the U.S. including Missouri, Iowa, North Carolina, and Ohio. Of course, these all surely vary in quality and price, and whether they are worthwhile to visit. One disappointing part is that toy museums often will have thousands of items that have no label or description. One might argue that a toy needs no description - that they are from recent-enough times that merely by looking at one, you can intuitively understand its age and function. However, in many cases, it would have been interesting to know exactly how old a toy was, where it was made, or at least something about it - perhaps, where and how the collector acquired it: Was it a gift? Something ordered online? Something found while traveling? Something donated to the museum? But, since toy museums are primarily enjoyed by children, they probably wouldn't have benefited that much from labels anyway. 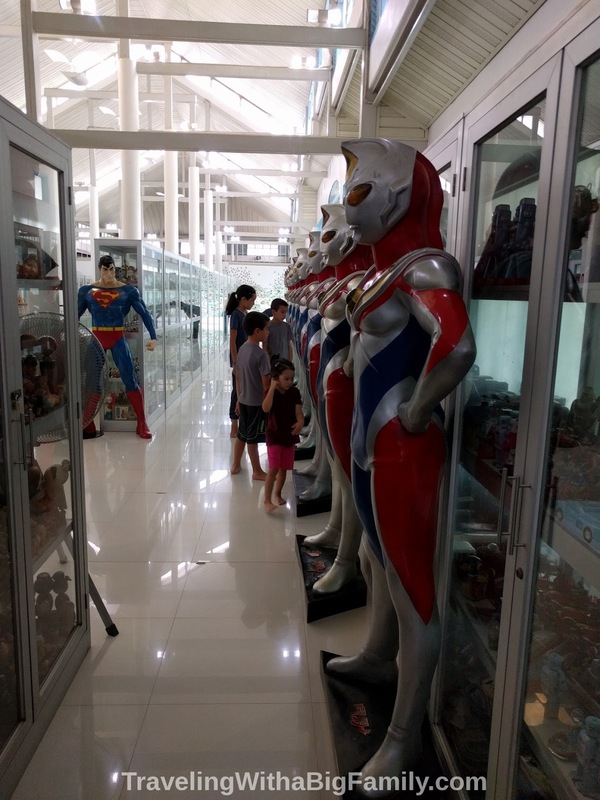 This toy museum was opened by a Thai named Krirk Yoonpun, who is a professor of children's literature. He visited a toy museum during a trip to Japan, and was inspired to open one of his own, in Thailand. This place gets mixed reviews, and after reading those, I had initially decided not to include this stop in our plans. 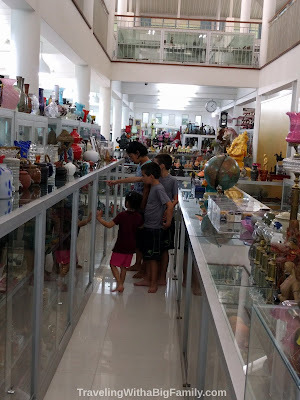 Note that the bottom floor is partially toys, and partially an exhibit of Thai cultural artifacts - meaning various vases, housewares, pottery, statues, etc. One morning in Ayutthaya it was raining almost non-stop, so we took a 50 baht tuk-tuk ride to this museum in between the rain showers. We quite enjoyed it, particularly as a rainy day activity. There is a modest admission, with children paying less than half of the adult price. There is no air-conditioning inside, and, since it is built in someone's home, you must remove your shoes. We spent about two hours here, walking from one story to the next on the hard floors, barefoot. There was also a diner/cafe out by the road, but it had exactly zero customers, so we didn't give it more than a passing glance. We tend to avoid eating at places where we don't see anyone else eating at meal-time. We found this one a bit difficult to locate, although it is smack in the middle of a busy intersection. The sign on the building said "Puppenhaus Museum" (Dollhouse Museum - its old name), and I was so busily looking for the word "Spielzeug" that I didn't even see the word "Museum" clearly written on the sign. 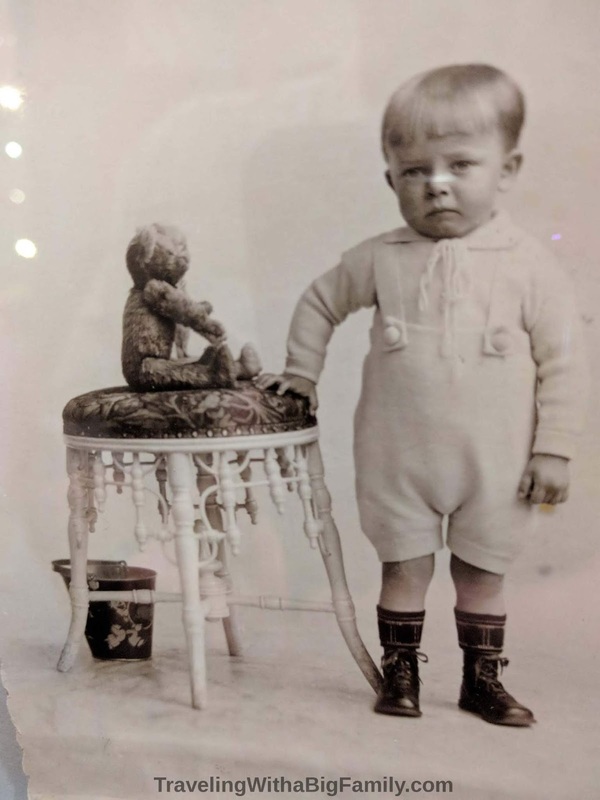 The stairwell at Spielzeug Welten Museum Basel is decorated with lots of very old photos - I found this one hilarious for some reason - little guy is clearly unhappy about this photo shoot! We walked right past it. We found it when we stopped right in front of it, looking all around, up and down the street, and considering backtracking the way we came. As my wife and I were discussing that this "had to be the place," but we just couldn't see it, we noticed that our kids were gazing into a store display window featuring numerous toys. The display made it look more like a toy shop than a museum, from outside - but that's because the ground floor does contain a toy store. We got our tickets on the ground floor and hurried upstairs to escape the gift shop (where surely our family of four could have spent over US $300 in under 60 seconds). I was pretty surprised to find that our kids absolutely adored this place. I had planned on this being a quick stop in Basel - perhaps 30 minutes. But we spent a full two hours here, staying until it closed (quite early, at 4pm). I had to bribe the children with an offer of gelato to get them moving towards the toy museum's exit. For a big family, I'd plan to spend at least 90 minutes to 2 hours here. You could easily spend 3 hours if you try to look at everything and examine the smaller objects really closely. Lots of the objects are miniature sets, which invite you to bend down and peer inside the tiny worlds created by the gifted artists that made the sets. There are tiny bakeries, tiny restaurants, nighttime sidewalks - all populated by smiling, porcelain Victorian figures enjoying wine or baking bread or taking a stroll with their families. They also had loads of teddy bears of every profession (schoolteacher teddy bears, doctor teddy bears...), lots of dolls, lots of truly creepy toys (those eyes! ), and more than a little bit of almost every kind of toy imaginable. Check the hours of operation before you go. Both of the toy museums we visited had strange hours and were closed on random days (e.g., they might be closed every Monday, etc.). Go early. Toy shops tend to close earlier in the day than other attractions. You'd also do well to find yourselves there long before any busloads of children might happen to show up. Eat before you go. For frugal travelers, eating at a museum is usually a last resort. Skip the gift shop unless you plan to drop a hefty load of cash and happen to have an empty suitcase on hand for the children's haul. Have you ever visited a toy museum? Where else have you gone solely for the kids, and then ended up enjoying it yourself just as much?